A special keepsake for your new arrival. This is a classic baby gift complete with a record section for entering the special events in a baby's life. 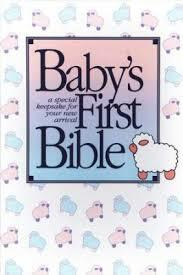 Includes birth record, family record, baby's first questions about God, a photo page where baby's picture can be attached, and much more. White hardcover. Illustrated edition. Words of Christ in red.